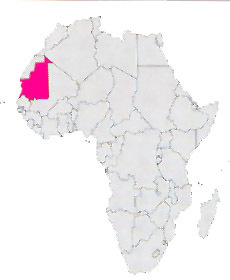 Great state of the north-western africa (3 times and half wider of Italy), but with alone 2 million and 700 thousand inhabitants (density 3 abs / Kmq). It is to a large extent desert to north and steppe to south, with scarce resources (iron and others mineral stones) and modest agricultural productions, insufficient to the requirement of the population. Practically it has an only true city the capital Nouakchott; despite the great extension it has only few hundreds chilometres of asphalted roads and the illiterates are over the 60% of the population. The desert extended in the most part of the country shows scenic erg, with perfect dunes which colours glide into orange, to yellow, up to white. To cross the western Sahara to reach the mauritanian Ksurs of Ouadane, Chinguetti, Tichit and Oulata, with the architectures in stone and the urban structures perfectly suited for the impossible Saharan climatic conditions, it is an unforgettable experience.